CNC Feeding and CNC Tending in collaboration mode. 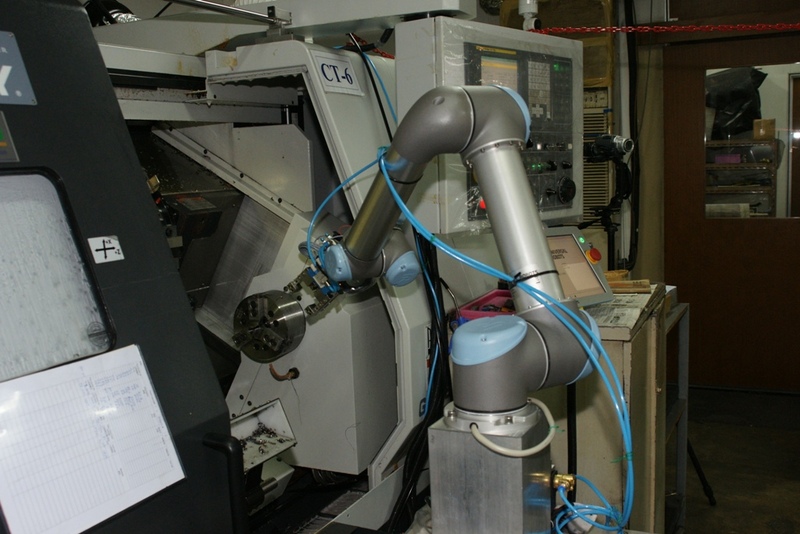 Universal-Robots REDUCES COST, OPTIMIZES PRODUCTION AT PRECISION ENGINEERING COMPANY. CNC feeding application in Singapore Video #1. CNC feeding application in Singapore Video #2. Rising wages and the intricate management of the labour force had created a challenging work environment for a Singapore-based company, Sky Engineering. 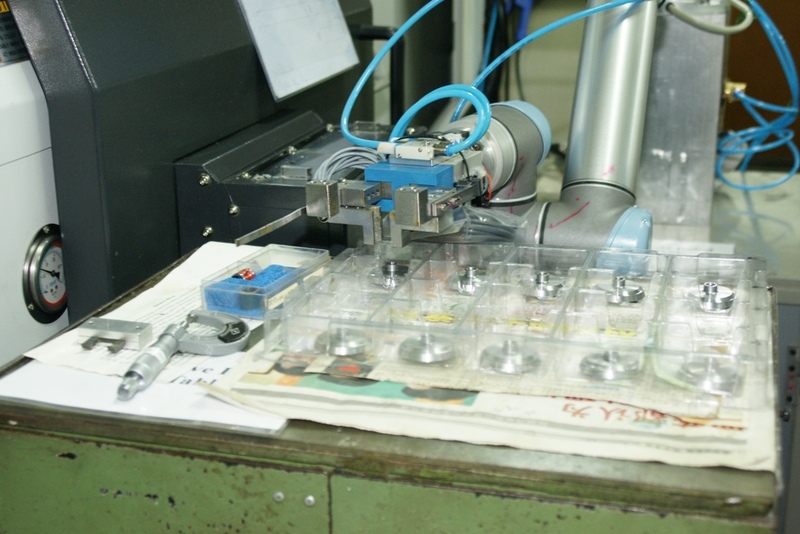 For a long time, this precision engineering company tried to reduce their production costs. 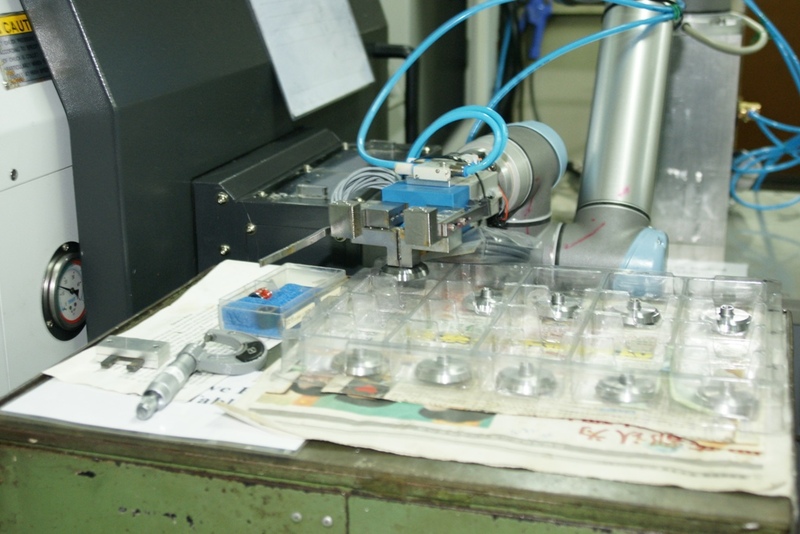 They finally succeeded with the implementation of Universal Robots in one of their CNC machines. 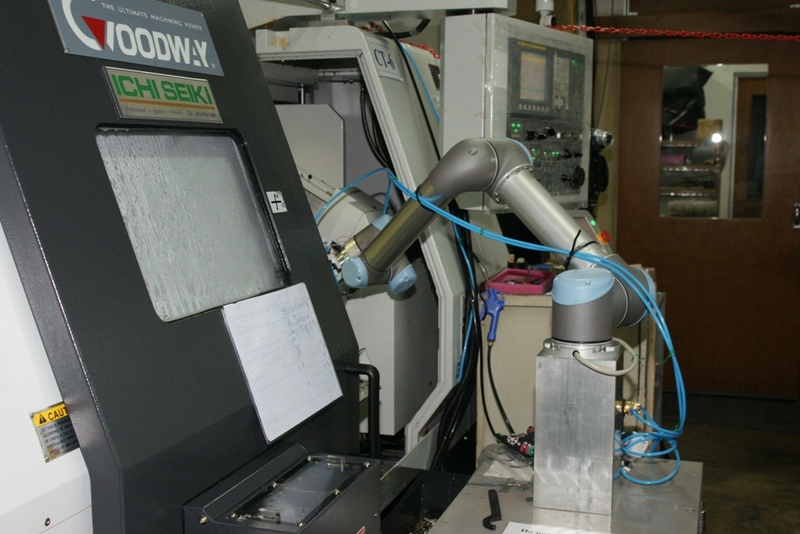 The UR robot was easy to integrate and the company now has the luxury of having one man tending to two CNC machines at any one time — something previously impossible to achieve when all tasks relied heavily on manual labour. 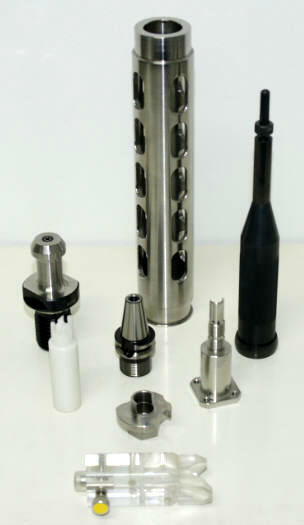 Sky Engineering is a precision engineering company established in 1972 specializing in aerospace components, gear hobbing, batch production, jigs and fixtures, semi-conductor tooling and surface treatments. 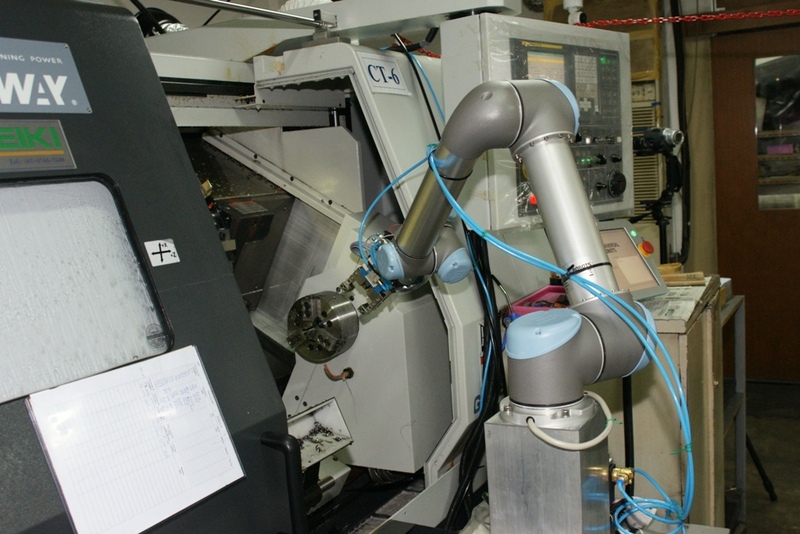 The company has always used manual labour in their production facility — the commissioning of Universal Robots is one of their very first steps towards automating the work tasks carried out in production. 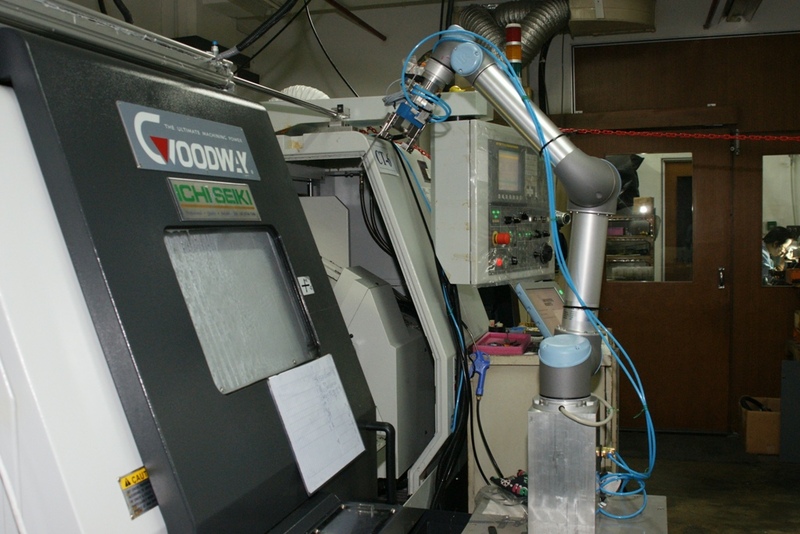 “The precision and repeatability in our applications are some very important factors as they contribute to better quality products,” explained George Kyaw, the Senior Operations Engineer who did the installation, implementation and programming of the robot in the CNC machine all by himself without any prior knowledge or experience in commissioning industrial robots. Why employ a robot? When faced with rising wages and the intricate management of their workforce, William Kuek, the Operations Manager of Sky Engineering was on the lookout for industrial robots to help alleviate these challenges. 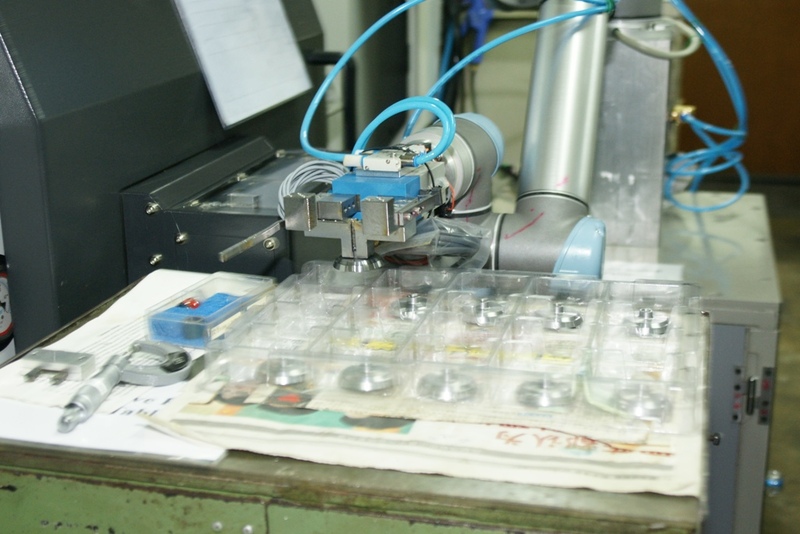 William came across Universal Robots and received a demonstration by one of the official distributors in Singapore, Zacobria Pte Ltd to learn about the Universal Robots’ technologies and unique features. “Our employees operate in a two shift workday with overtime. 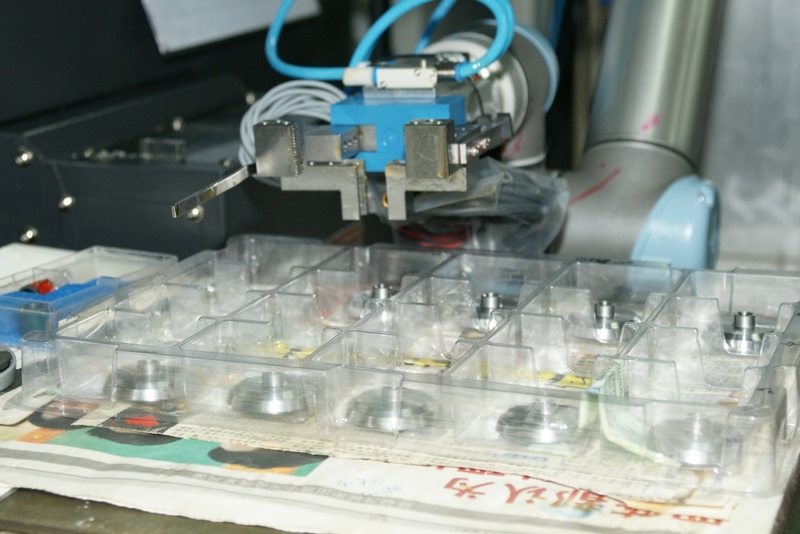 This can be very tiring, especially if all tasks are to be done manually with great amount of concentration,” explains William Kuek, who decided to start out by implementing and testing a robot in one of Sky Engineering’s CNC machines. Safe and easy to program In testing the robot, Sky Engineering had several demands of their new “colleague”: “Apart from the robot’s ability to perform and repeat precision tasks, it is imperative that it’s safe for our employees to work in close proximity with the robot and the CNC machines. Implementation and programming should pretty much be plug and play,” says William Kuek and explains that Sky Engineering has very limited workspace in the production facility and employees with no prior knowledge or experience in commissioning industrial robots in CNC machines. 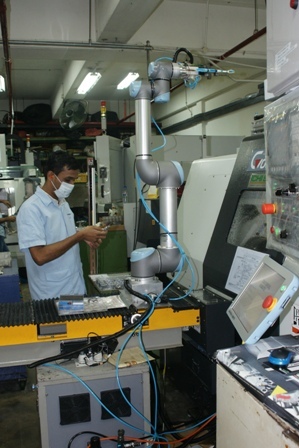 “Having our own employees being able to implement and program the robot will help us save significant costs,” says George Kyaw while also highlighting the ROI: “Obviously, the robot pricing and the payback period are some of the greatest considerations in the decision making process of automating some of the manual tasks in our production. 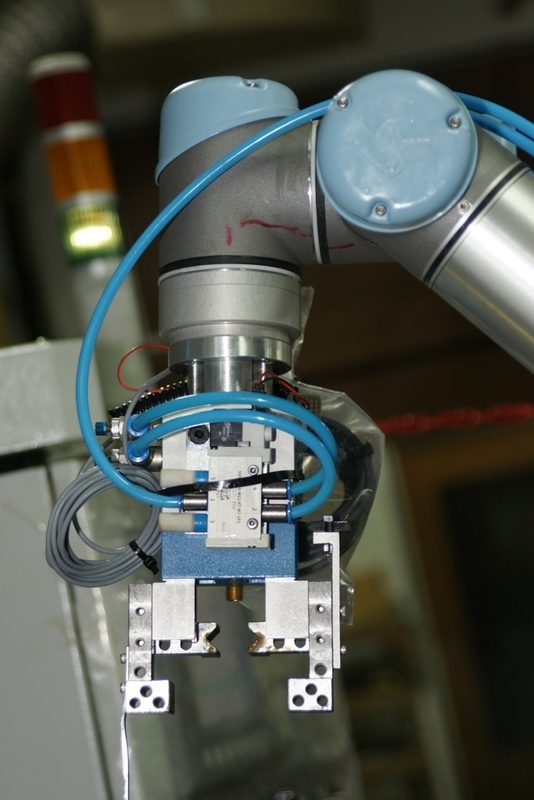 Universal Robots give a good payback period of about 15 months, are user friendly and flexible in the overall sense. 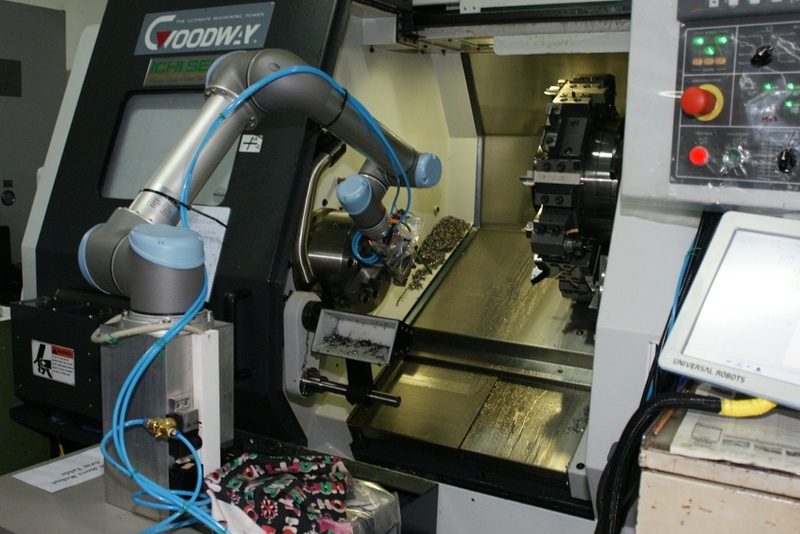 This is why we chose a robot from this company.” CNC jobs carried out by the robot The Universal Robot, model UR5, at Sky Engineering is currently programmed to perform CNC tending comprising of different tasks during the cycle of work pieces that the CNC machine is producing. The main task is to automatically remove finished work pieces from the CNC chuck and line them in a container after the CNC machine has completed milling of the raw material. 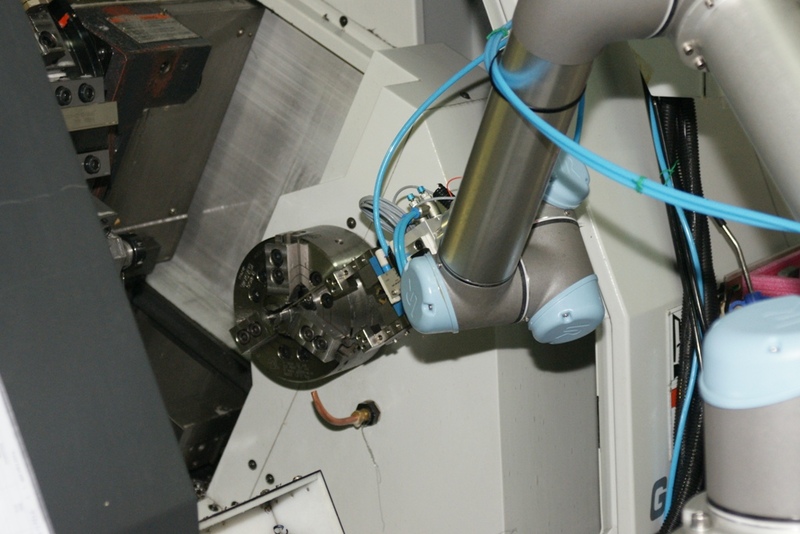 Having done this, the UR5 also prepares the CNC machine for the next cycle by performing various cleaning tasks such as blowing leftover scraps of metal chips away and cleaning the CNC tool. 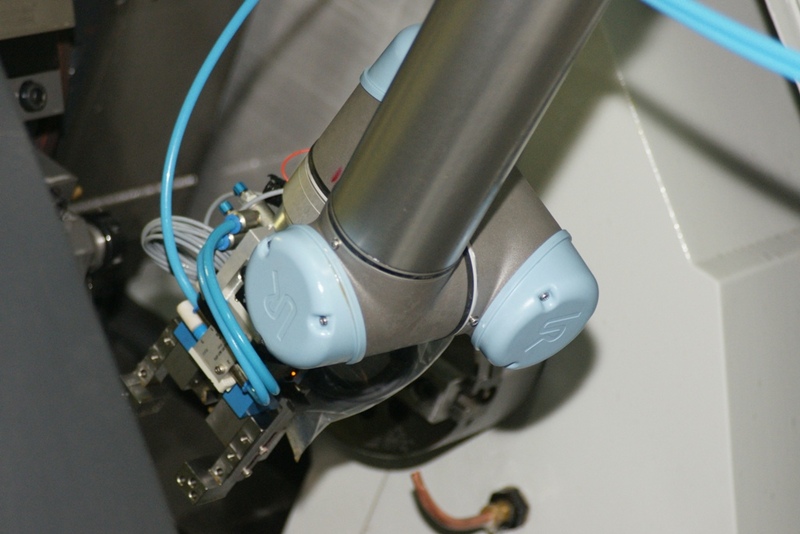 In addition, the UR5 opens and closes the CNC door automatically via the in- and outputs found on the controller box of the robot. 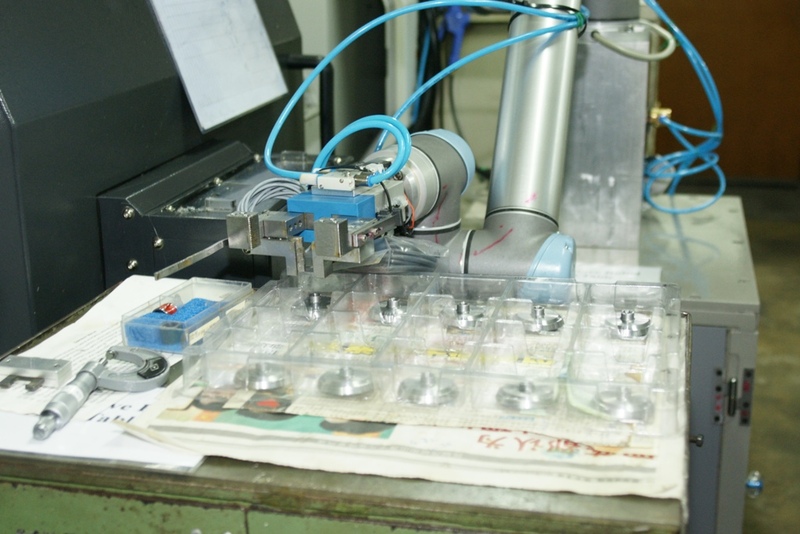 About the robots Universal Robots is a result of many years of intensive research in robotics. 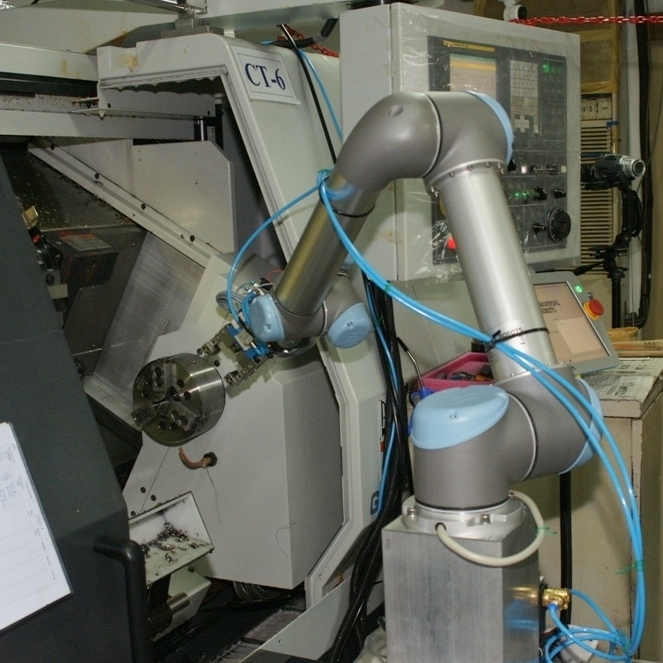 The six-axis robot arms can easily be implemented in many industries; from a small CNC lathe production to large automobile assembly lines. The product portfolio currently includes the UR5 and UR10 models that handle payloads of up to 5 and 10 kilos and weigh a mere 18 and 28 kilos respectively. 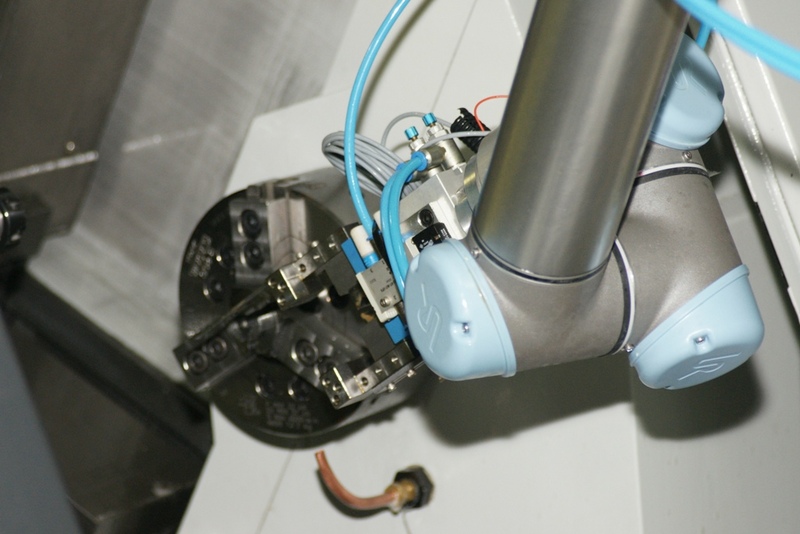 Due to their weight, size, safety and ease of programming, the UR robots can easily be moved around and installed in different parts of the production facility. 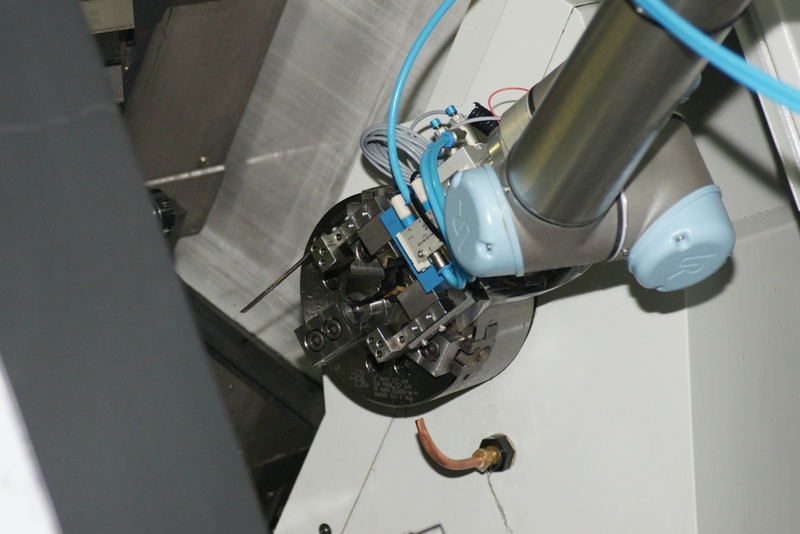 A significant benefit is the robot’s capability to operate with no safety shielding — as soon as an employee comes into contact with the robot arm and a force of at least 150 Newton is exerted, the robot arm will automatically stop operating. 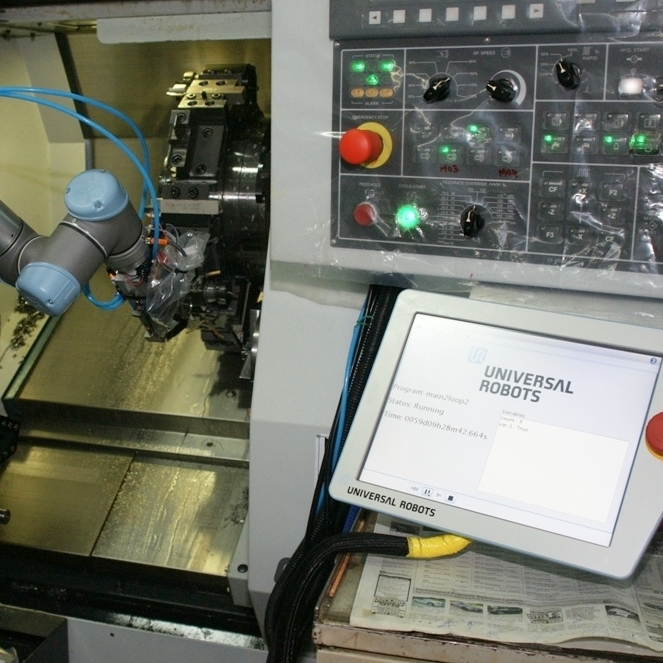 Universal Robots’ intuitive graphical user interface, (GUI) allows the user to set up and program the UR robot in as little as half an hour. The user does not need to be a skilled programmer to do this, programming can be done by dragging and dropping standard routines into an on-screen “script” for the robot, or by simply grabbing the robot arm, showing it the desired movements. 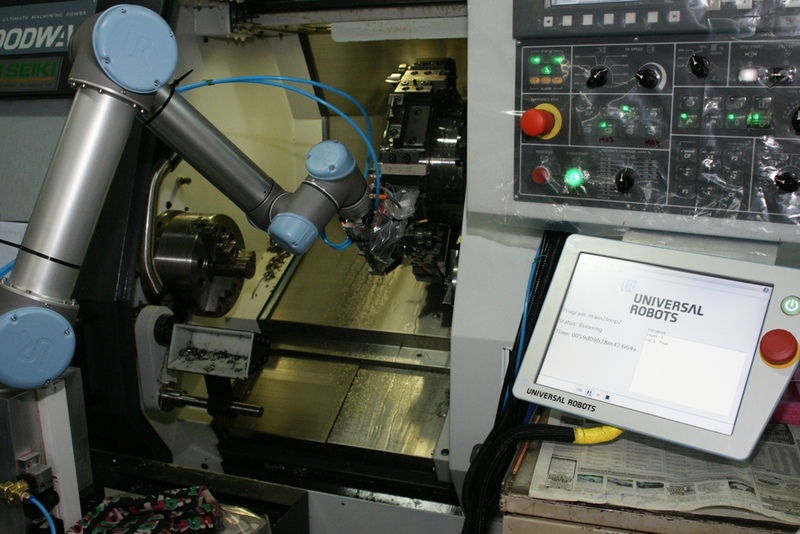 Universal Robots developed the GUI, called Polyscope, which runs on top of a Linux OS platform enabling easy customization for specific tasks and tools. 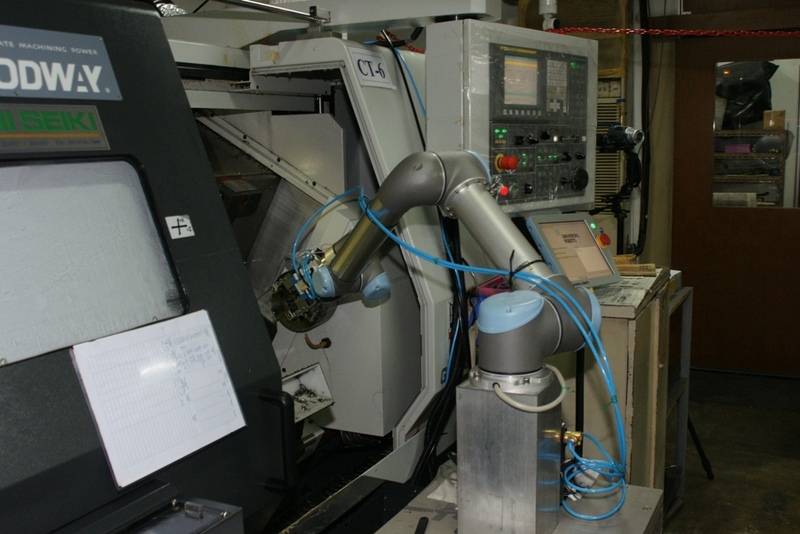 The Polyscope programming developer facility needed for this customization is supplied with the robot. 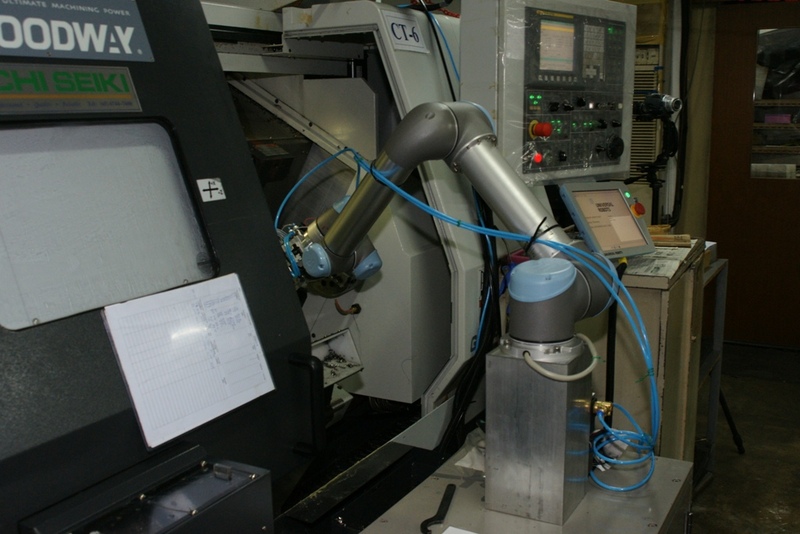 The robot is also equipped with digital and analog inputs and outputs I/O ports and Ethernet interfaces for communication with external equipment and other control systems such as PLC and SCADA systems through the I/O or Ethernet socket. The robot and controller can control a small cell as well as sensors, vision systems, activation of conveyors and other external equipment. 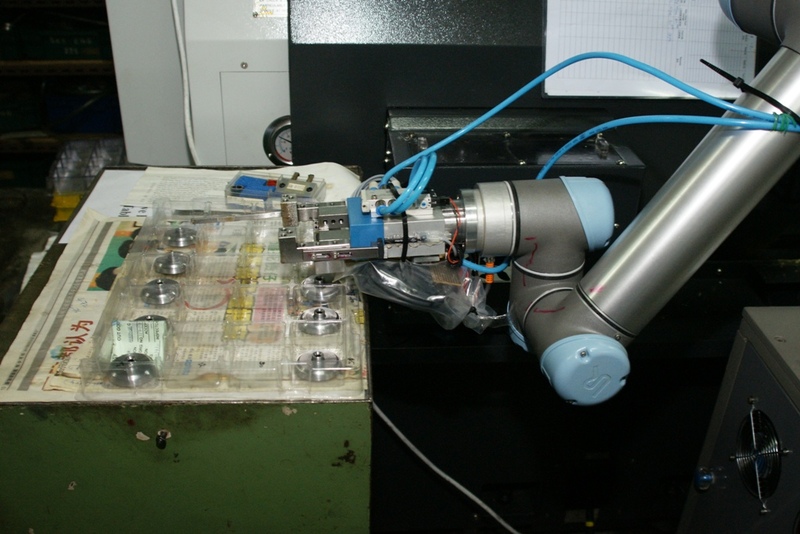 The UR robots have very low energy consumption and make less noise in comparison with bigger and more expensive robots.